Things would look similar for OmniWeb and Firefox, obviously. As you can see, everything is a clickable link—click a folder, and you’ll drill down into it. Click an image (or other file type your browser can handle), and it will display. Click a file type that your browser can’t handle, and you’ll be asked if you want to download it. 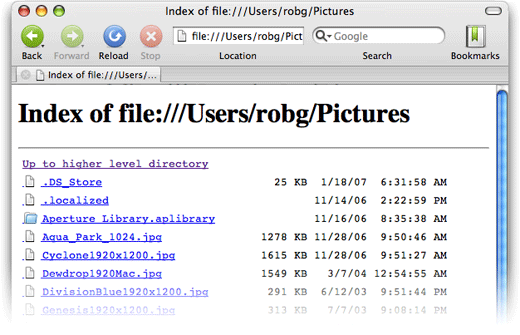 The reason this technique doesn’t work in Safari is because Safari sends any file:// requests off to the Finder. So instead of seeing the requested folder in the browser window, you’ll see it in the Finder. Want to browse through an application’s bundled files? Type file:///Applications/iPhoto.app, for example, then click down into Contents -> Resources. Want to browse a typically-hidden folder, such as /etc ? Just enter file:///etc and there you go. Yes, the Finder makes a better Finder than does a browser, most of the time. But if you’re a browser fanatic, or like having Back and Forward buttons for your file browsing, or just like being different, you just might find this tip useful.